The GVW of the towing vehicle must not exceed the Gross Vehicle Weight Rating (GVWR) shown on the F.M.V.S.S./C.M.V.S.S. certification label. The GVW equals the combined weight of the unloaded vehicle, passengers, luggage, hitch, trailer tongue load and any other optional equipment. In addition, front or rear GAW must not exceed the Gross Axle Weight Rating (GAWR) shown on the F.M.V.S.S./C.M.V.S.S. Towing capacities are calculated assuming a base vehicle with driver and any options required to achieve the rating. Additional passengers, cargo and/or optional equipment, such as the trailer hitch, will add weight to the vehicle and reduce your vehicles maximum towing capacity and trailer tongue load. The vehicle and trailer need to be weighed to confirm the vehicle is within the GVWR, Front GAWR, Rear GAWR, Gross Combined Weight Rating (GCWR) and Towing capacity. All vehicle and trailer weights can be measured using platform type scales commonly found at truck stops, highway weigh stations, building supply centers or salvage yards. To determine the available payload capacity for tongue load, use the following procedure. 1. Locate the GVWR on the F.M.V.S.S./C.M.V.S.S. certification label. 2. Weigh your vehicle on the scale with all of the passengers and cargo that are normally in the vehicle when towing a trailer. 3. Subtract the actual vehicle weight from the GVWR. The remaining amount is the available maximum tongue load. To determine the Gross Trailer Weight, weigh your trailer on a scale with all equipment and cargo, that are normally in the trailer when it is towed. Make sure the Gross TrailerWeight is not more than the Gross TrailerWeight Rating shown on the trailer and is not more than the calculated available maximum towing capacity. Also weigh the front and rear axles on the scale to make sure the Front Gross AxleWeight and Rear Gross Axle Weight are not more than Front Gross Axle Weight and Rear Gross Axle Weight on the F.M.V.S.S./C.M.V.S.S. certification label. The cargo in the trailer and vehicle may need to be moved or removed to meet the specified ratings. - Gross Vehicle Weight (GVW) as weighed on a scale - including passengers, cargo and hitch - 4,446 lb. (2016 kg). - Gross VehicleWeight Rating (GVWR) from F.M.V.S.S./C.M.V.S.S. certification label - 4,546 lb. (2062 kg). - Maximum Towing Load from Towing Load/Specification9 chart - 1,000 lb. (454 kg). 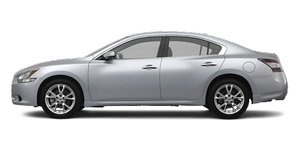 The available towing capacity may be less than the maximum towing capacity due to the passenger and cargo load in the vehicle. Remember to keep trailer tongue weight between 10 - 15% of the trailer weight or within the trailer tongue load specification recommended by the trailer manufacturer. If the tongue load becomes excessive, rearrange the cargo to obtain the proper tongue load. 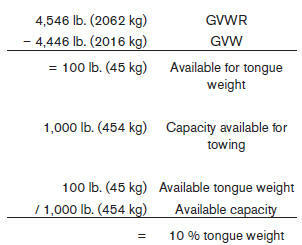 Do not exceed the maximum tongue weight specification shown in the Towing load/specification chart even if the calculated available tongue weight is greater than 15%. If the calculated tongue weight is less than 10% , reduce the total trailer weight to match the available tongue weight. Always verify that available capacities are within the required ratings.